This custom George Elsissa gown is absolutely stunning and looks incredible in photographs. If you are a bride after something unique and luxurious this is the gown for you! This gown would fit a size AUS 4 to 8. Your dressmaker can easily alter the back to suit a larger or smaller size. The bust works for a B cup up to a D cup thanks to removable padding. On the bodice white 3D French lace appliqué details are placed strategically on top of fine silver thread mesh and sheer panels, to enhance the body’s hourglass shape. 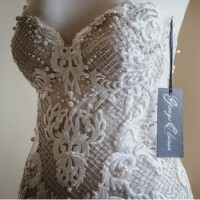 Various sized Swarovski pearls are sewn individually and placed over the entire bodice. Internal boning, an invisible heavy-duty zipper, with metal eye hooks at the back hold this strapless sweetheart gown in place. The approx. 3-meter long, structured ruffled multilayer skirt and train, have various sized Swarovski pearl clusters scattered throughout, to compliment the bodice detail. In addition to hidden piping on the ruffles, the skirt is has a tulle petticoat to maintain a full appearance and make it easy to walk in. This gown has been dry-cleaned. To maintain its fantastic condition serious buyers only please. *Please note; Extra details and photos can be made available on request. Price open to reasonable negotiations.